Because it didn’t just have anti-fungal properties. The researchers at Wyeth discovered that rapamycin did a lot more than just kill fungi (and before we continue, I can recommend you read this article about the history of the discovery of Rapamycin – it’s an amazing story!). Rapamycin was also a powerful suppressor of the immune system (reducing the ability of the immune system to do its job) and it demonstrated strong anti-cell proliferative properties. These properties resulted in new immune suppression treatments for organ transplant procedures (Rapamycin itself received clinical approval in 1999 for use in the prevention of organ rejection in kidney transplant patients) as well as novel cancer treatments (Torisel and Afinitor were approved in 2007 and 2009 for treatment of advanced kidney cancer), in addition to a host of other medical applications. But what really fascinated the researchers was the HOW. How was Rapamycin doing all of these things? How was a compound that was produced by a soil bacteria be having all of these effects? And after many years of further research they discovered that these properties resulted from rapamycin’s interactions with a protein called mTOR. Mechanistic target of rapamycin (or mTOR) is a protein that serves as a central regulator of cell metabolism, growth, and survival. It integrates signals from both inside (intracellular) and outside (extracellular) the cell. It performs its various activities via two protein complexes (that is a combination of proteins that must bind together in order to do their function). These two complexes are known as mTOR Complex 1 (TORC1) and mTOR Complex 2 (TORC2). What do TORC1 and TORC2 do? Autophagy (from the Ancient Greek αὐτόφαγος autóphagos, meaning “self-devouring”) is an absolutely essential function in a cell. Without autophagy, old proteins would pile up making the cell sick and eventually causing it to die. Through the process of autophagy, the cell can break down the old protein, clearing the way for fresh new proteins to do their job. Waste material inside a cell is collected in membranes that form sacs (called vesicles). These vesicles then bind to another sac (called a lysosome) which contains enzymes that will breakdown and degrade the waste material – the same way enzymes in your washing powder break down muck on your dirty clothes). The degraded waste material can then be recycled or disposed of by spitting it out of the cell. While activating TORC1 reduces autophagy, inhibiting TORC1 activity results in an increase in autophagy – the waste disposal and recycling process (remember this last part – inhibiting TORC1 activity results in an increase in autophagy – the waste disposal and recycling process). Reducing TORC1 activity has also been shown to prolong lifespan, enhance immune function, enhancing memory, and delaying the onset of age-related conditions in multiple animal models (Click here for a review of this topic). On a very basic level, TORC1 and TORC2 are like yin & yang. While inhibiting TORC1 is associated with lots of good stuff, TORC2 inhibition has been associated with lots of bad stuff (eg. decreased lifespan, worsening memory, etc – Click here for more on this). This major difference has lead a lot of biotech/pharmaceutical companies seeking to develop drugs that inhibit TORC1, but do NOT disrupt TORC2 activity. But hang on a second, what about rapamycin? How does it interact with mTOR, TORC1 and TORC2? Rapamycin is an inhibitor of mTOR – it has a mTOR binding region (see image below), but it affects TORC1 and TORC2 differently. TORC1 is very sensitive to rapamycin, and becomes inhibited in its presence. TORC2, on the other hand, is considered to be resistant to rapamycin (except under conditions of long term exposure). Ok, so rapamycin inhibits mTOR/TORC1 which enhances autophagy/waste recycling. But what does any of this have to do with Parkinson’s? Rather a lot of research has been conducted on mTOR & autophagy in the context of Parkinson’s. Title: Selective molecular alterations in the autophagy pathway in patients with Lewy body disease and in models of alpha-synucleinopathy. Authors: Crews L, Spencer B, Desplats P, Patrick C, Paulino A, Rockenstein E, Hansen L, Adame A, Galasko D, Masliah E.
Journal: PLoS One. 2010 Feb 19;5(2):e9313. In this study, the researchers found that levels of mTOR were higher in the brains of individuals who passed away with Lewy body-associated conditions (such as Parkinson’s or Lewy body dementia) than the brains of unaffected control subjects or even brains from people with Alzheimer’s. The investigators also reported similar high levels of mTOR in the brains of mice that had been engineered to produce high levels of the Parkinson’s associated protein, alpha synuclein. This protein builds up in the brain in Parkinson’s and is believed to be associated with the cell death that is seen in the condition. The researchers in this study treated these mice with rapamycin, which reduced the accumulation of alpha synuclein in these mice and protected them from “associated neurodegenerative alterations”. Other research groups have also demonstrated the ability of rapamycin to rescue alpha synuclein-based models of Parkinson’s (Click here and here to read examples). And rapamycin has also been shown to have beneficial effects in other neurotoxin-based models of Parkinson’s. Title: Rapamycin protects against neuron death in in vitro and in vivo models of Parkinson’s disease. Authors: Malagelada C, Jin ZH, Jackson-Lewis V, Przedborski S, Greene LA. Journal: J Neurosci. 2010 Jan 20;30(3):1166-75. 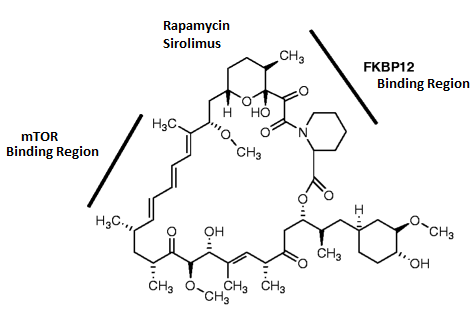 In this study, the researchers found that rapamycin (“rapa”in the image below) was able to protect cells in various neurotoxin-based models of Parkinson’s. 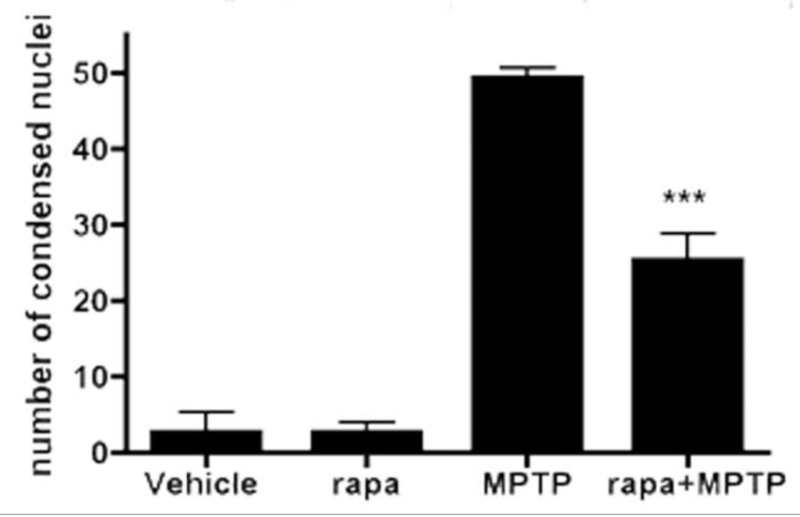 Rapamycin achieved this effect by only inhibiting certain mTOR activities, because when the investigators compared rapamycin to a more complete mTOR inhibitor (Torin1, which blocks both TORC1 and TORC2 activities), only rapamycin was able to protect the cells exposed to the neurotoxins. And similar neuroprotective results from rapamycin treatment in neurotoxic models of Parkinson’s have also been published by other research groups (click here, here, and here to read some examples). Title: Rapamycin activation of 4E-BP prevents parkinsonian dopaminergic neuron loss. 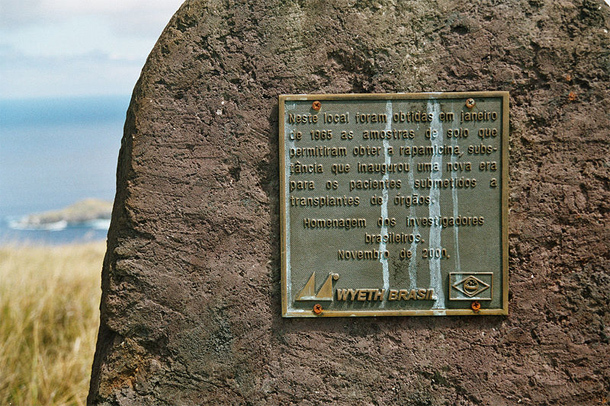 Authors: Tain LS, Mortiboys H, Tao RN, Ziviani E, Bandmann O, Whitworth AJ. Journal: Nat Neurosci. 2009 Sep;12(9):1129-35. In this study, the researchers reported that rapamycin rescued mitochondrial defects in cells collected from people with PARKIN-associated Parkinson’s (Click here to read a previous SoPD post about PARKIN and the related mitochondrial issues). In fact, the investigators found that when flies with Parkinson’s-associated PARKIN or PINK1 genetic mutants were raised and aged on rapamycin supplemented food, they exhibited little or no dopamine neuron degeneration. Authors: Guri Y, Colombi M, Dazert E, Hindupur SK, Roszik J, Moes S, Jenoe P, Heim MH, Riezman I, Riezman H, Hall MN. Journal: Cancer Cell. 2017 Dec 11;32(6):807-823.e12. Accumulation of glucosylceramide is associated with GBA-associated Parkinson’s (Click here to read more about this). The investigators found that mTOR inhibition reduced glucosylceramide levels. And it has been previously reported that rapamycin treatment can rescued models GBA-associated Parkinson’s (Click here to read more about this). Thus, there is ample preclinical evidence indicating that rapamycin/mTOR modulation could be interesting to assess in the context of Parkinson’s. There is evidence for TORC1 inhibition potentially having beneficial effects in many conditions associated with intracellular protein aggregation. Most recently, it was reported that a protein called dynasore inhibits TORC1 activity and this helps to reduce levels of proteins associated with the neurodegenerative condition of Huntington’s disease. Title: Dynasore Suppresses mTORC1 Activity and Induces Autophagy to Regulate the Clearance of Protein Aggregates in Neurodegenerative Diseases. Authors: Chen Y, Xu S, Wang N, Ma Q, Peng P, Yu Y, Zhang L, Ying Z, Wang H.
In this study, the researchers found that by treating cells with a protein called dynasore they inhibited the activity of TORC1, which resulted in an increase in autophagy. When they caused cells to produce high levels of the toxic Htt protein (associated with Huntington’s disease) and then treated the cells with dynasore, they found that TORC1 levels were reduced and autophagy activity increased, which enabled these cells clear the build up of this neurodegeneration-associated protein. Remind me again, what is Huntington’s disease? Huntington’s disease is a neurodegenerative condition which results in individuals losing all inhibition of movement, giving rise to appearance of chorea – jerky, random, and uncontrollable movements (similar to dykinesias). Huntington’s disease is caused by an increase in a region of DNA inside the Huntingtin (Htt) gene. This regions is made up of CAG repeats. In normal healthy humans, we usually have up to 30 repeats of CAG. If you have more than 40 CAG repeat, you are definitely going to develop Huntington’s disease. The expansion of the CAGs in the Huntingtin gene results in a mutant Huntingtin protein, which is believed to be associated with the problems observed in people suffering from Huntinton’s disease. Interesting. So the take-home message is TORC1 inhibition increases autophagy/waste disposal which helps to clear the accumulation of proteins associated with neurodegenerative conditions? So where can I get me some rapamycin? Yeah, before you think about doing that, please understand that clinicians and researchers are extremely weary about long term use of rapamycin for any condition. As we discussed above, TORC2 is considered to be resistant to rapamycin (except under conditions of long term exposure). The great worry about using rapamycin over the long term is that it will start to affect TORC2 as well as TORC1 activity, and that would not be a good thing. 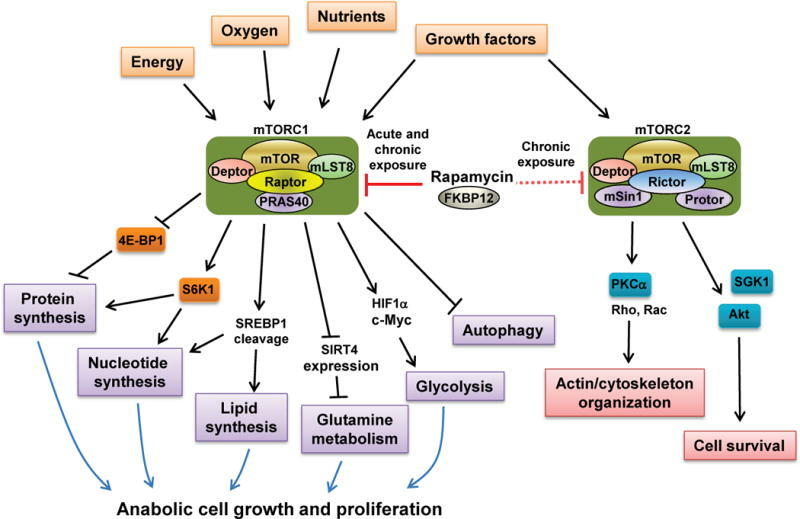 There has been tremendous excitement generated around mTOR modulation as a means of extending life span (this has only been demonstrated in mice, not in humans), but the long term use of rapamycin has several undesired side effects. As a result of these issues, there has been a great deal of research by biotech/pharmaceutical companies seeking alternatives to rapamycin. Specifically, they have been working on drugs that ONLY inhibit TORC1. Which brings us to resTORbio Inc. This Boston (USA) based biotech firm has developed an experimental compound called RTB101, which is a potent TORC1 inhibitor. The company has been clinically testing this drug on respiratory tract infections in the elderly, but encouraged and supported by the Silverstein Foundation, they are now testing the therapeutic potential for RTB101 in Parkinson’s. Which brings us to this new clinical trial in New Zealand. The new Phase Ib/IIa study will evaluating the safety and tolerability of resTORbio’s TORC1 inhibitor RTB101 in 45 people with recently diagnosed Parkinson’s (who are already on standard care – Click here to read the press release). • Group 1: RTB101 300 mg capsule given orally once per week for up to 4 weeks. • Group 2: Sirolimus 2 mg tablet given orally once per week for up to 4 weeks. • Group 3: RTB101 300 mg capsule + sirolimus 2 mg tablet given orally once per week for up to 4 weeks. • Group 4: RTB101 300 mg capsule + sirolimus 4 mg tablet given orally once per week for up to 4 weeks. • Group 5: RTB101 300 mg capsule + sirolimus 6 mg tablet given orally once per week for up to 4 weeks. The study will including people with and without GBA genetic variants. The primary endpoint of the study will be safety and tolerability, and the secondary endpoints will be amount of drug in blood and cerebrospinal fluid (the liquid that our brains sit in). There are also some exploratory endpoints, which will include blood and cerebrospinal fluid biomarkers, as well as some clinical assessments. The results of the trial are expected in 2020 (click here to read more about this trial). Sirolimus is rapamycin (Click here for the wikipedia page and click here to read more about this drug). And why are they testing it in combination with RTB101? The reason the researchers are using Sirolimus is because they are keen to learn if it changes the shape of the TORC1 protein complex, which would allow a lower dose of RTB101 to be used over time. Can using both drugs in combo allow for lower doses of both, as opposed to high doses of them being used by themselves. Has RTB101 ever been tested in humans before? There have been several studies. Most recently RTB101 was tested in a Phase IIb clinical trial for reducing the incidence of respiratory tract infections (Click here to find out more about that trial). The results of that trial were announced by resTORbio last July (Click here to read the press release). And there was additional analysis of data from the study announced in October (Click here to read more about this). The study found that all doses of RTB101 were safe and well-tolerated, and that 10 mg of RTB101 once daily had a comparable safety profile to the placebo control treatment. Note that this was a daily treatment regime, whereas the NZ trial will involve just a weekly dosing. Collectively data from two Phase II clinical trials of RTB101 (testing the drug in more than 900 elderly subjects) suggest that this drug is well tolerated and resulted in a 30.6% reduction in the incidence of laboratory-confirmed respiratory tract infections. Interesting. So summing up? What does it all mean? Title: Inhibition of mTOR signaling in Parkinson’s disease prevents L-DOPA-induced dyskinesia. Authors: Santini E, Heiman M, Greengard P, Valjent E, Fisone G.
Journal: Sci Signal. 2009 Jul 21;2(80):ra36. In this study, the researchers found that the development of L-DOPA-induced dyskinesia in a mouse model of Parkinson’s led to dopamine D1 receptor-mediated activation of TORC1. They also demonstrated that treating the mice with rapamycin prevented the development of dyskinesia without affecting the therapeutic properties of L-DOPA. And this research has been independently replicated in rats (Click here to read more about this), plus there is evidence to suggest that genetic variations in genes associated with the mTOR pathway could leave some individuals susceptible to developing L-DOPA-induced dyskinesias (Click here to read more about this). Thus, even if RTB101 fails to demonstrate any long-term disease modifying properties in Parkinson’s in future studies, it could still have the potential to improve quality of life for individuals with Parkinson’s who are suffering from dyskinesias. 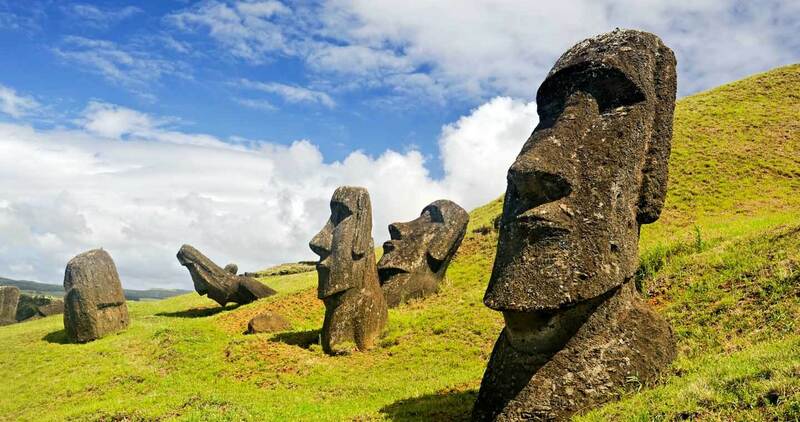 As a proud kiwi I am always keen to highlight new Parkinson’s related research being generated in the homeland (for example, the kiwi ketogenic diet in Parkinson’s study – Click here for that SoPD post). I am also very pleased to see clinical trials focused on disease modification in Parkinson’s being conducted in New Zealand (for example the Living Cell Technology clinical trials – Click here to read the SoPD post on that topic). And this new study is of particular interest to me – I am very curious to see the outcome of this clinical trial programme. As we have discussed before (Click here for that post), any “curative” therapy for Parkinson’s will require a disease-halting mechanism. And one potential “indirect” method of slowing/stopping the progression of Parkinson’s is boosting the waste disposal system of the cell. By ‘chewing up and spitting out’ the accumulating alpha synuclein and associated proteins, it is hoped that cells will be able to function better and be more healthy. This would predictably slow down the progression of the condition. Thus, given that RTB101 enhancing autophagy (waste disposal) activity in cells, I like the premise behind this new trial. That said modulating autophagy is a difficult balancing act. But it will be interesting to see if just a slight increase could have beneficial effects for folks with Parkinson’s. In New Zealand, the koru is a spiral symbol based on the appearance of a new unfurling silver fern frond. It has very important symbolism for the native people of Aotearoa – the Maori – and it has taken a permanent place in the modern society. It represents new life, growth, and strength. Nice symbolism for this new study. In addition, the company resTORbio Inc which is mentioned in this post is a publicly traded company. That said, the material presented on this page should under no circumstances be considered financial advice. Any actions taken by the reader based on reading this material is the sole responsibility of the reader. resTORbio Inc has not requested that this material be produced, nor has the author had any contact with the company. This post has been produced for educational purposes only. The banner for today’s post was sourced from restorbio. Kiwis are so cool! Awesome post.